With a surname that means Rose Branch, it is no surprise that Hannah Rosengren creates with intent to celebrate and protect the beauty in nature. 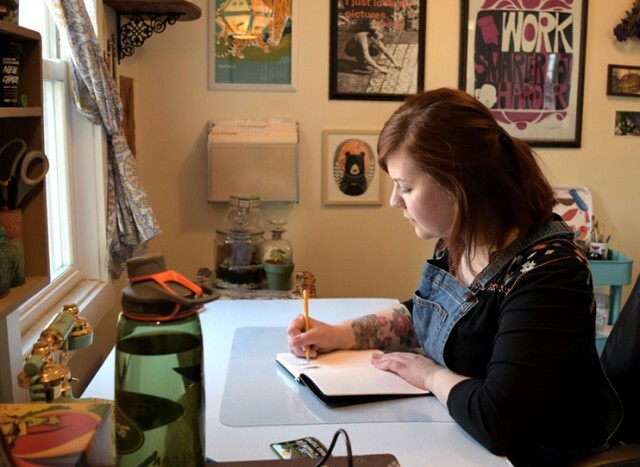 I had the pleasure of connecting with Hannah recently, and asked her a few questions about her journey and purpose in being a professional illustrator. With an unbelievably kind and generous nature, Hannah is unassuming yet very clearly walks her path. I was so impressed by her gentle humble disposition, and when I dug into her past to hear what led her to become an illustrator, she shared with reserved respect that despite her interests to be an illustrator Hannah felt social influence to choose a different profession. Lucky for the world, Hannah, listened to her intuition and kept her dream alive, making her a very inspiring role model. Such a pleasure to introduce, Hannah Rosengren! 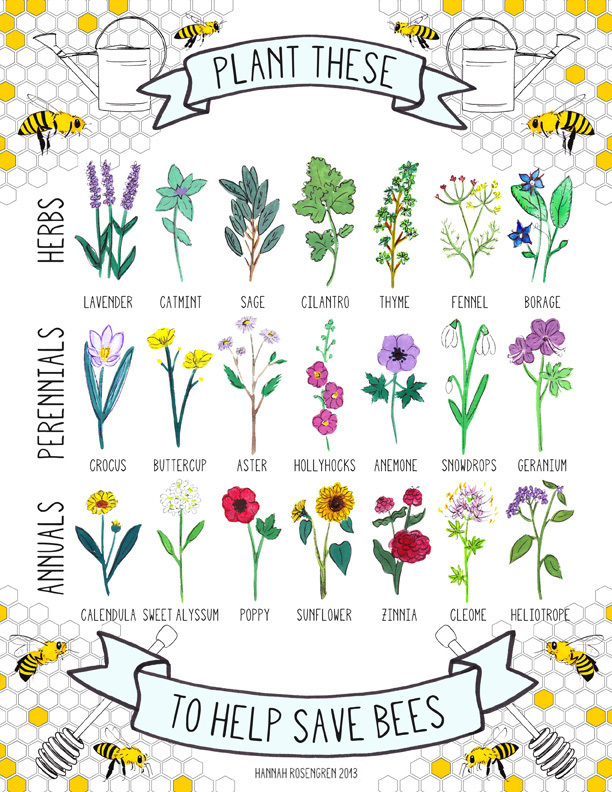 As the illustrator behind the now iconic poster “Plant these… to help save bees” can you share where the inspiration for this poster came from? You undoubtedly care greatly for the environment. Were you raised with a strong connection and awareness of the world around you and the changes that are happening? I was working at the Portland Museum of Art at the time and really wanted to add more work to my portfolio. Having graduated five months earlier, almost everything in my portfolio was student work and I wanted to create something more focused and personal. 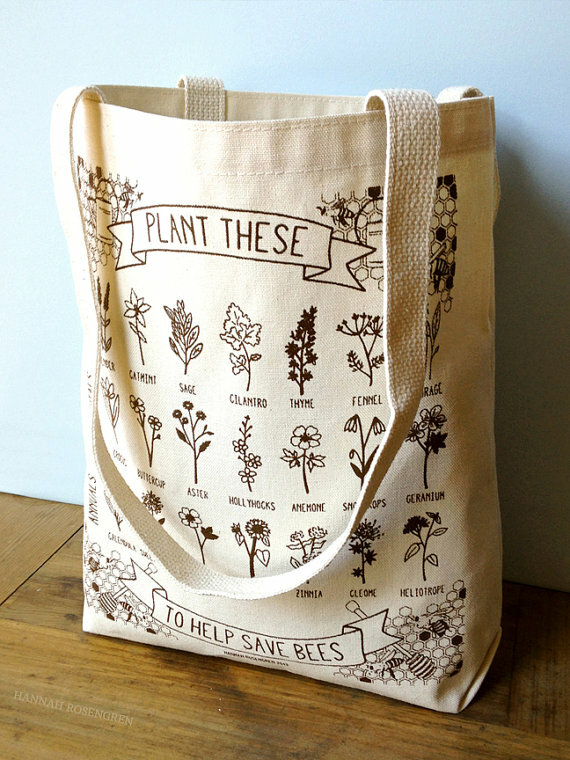 I had been hearing more and more about the rapidly-decreasing honey bee populations and read that planting flowers that attract them would be something that anyone could do to help. I’ve always loved vintage botanical illustrations and thought it would be a good opportunity to practice my own approach to illustrating plants at the same time. I definitely grew up with an appreciation for the environment and spent a lot of time out in nature with my family – in the woods, on the ocean, learning how to take care of the garden at our house. I’ve always felt most comfortable when out in nature and am still constantly inspired by it. People create art and design every day, but not everyone does so with such clear purpose. You used your talents to help create specific change, and you did it in a really successful way. You drew people into the message. You are a gentle arts activist. This must feel really good! Thank you so much. It definitely does! With this poster especially, it wasn’t just creating it that was important but having an audience to help share the information. I think it really shows how powerful art can be in making serious issues feel more approachable. When you created this poster, did you have any idea how well received it would be? It seemed to be just what the world needed! How many languages is your poster printed in now? I had no idea it would be so well-received or shared so many times! It was up on my blog and website for a few months before anyone really took notice, and then it blew up online practically overnight. So far it’s been printed in Spanish, Swedish, Montenegrin, and soon French. It’s been incredibly exciting to see people from all over the world speak up about Colony Collapse Disorder and share my work – often pledging to not only plant some of the things on the list but to care for them in an ecological way, too. You are a professional artist, you get to spend your days drawing and painting, which is a dream for many. What led you to this path? While I’ve always been interested in being self-employed and/or a professional artist, I really had no idea what form that would take or how to make it happen until I went to college. I originally went to school out-of-state for studio art, but realized after a couple of years that illustration would be a lot more fitting and transferred to Maine College of Art. During the winter following graduation, I felt like my Etsy shop and freelance work were steady enough to take the leap into making “freelance illustrator” my official job title – and I’m so glad I did. It’s hard work but very exciting! 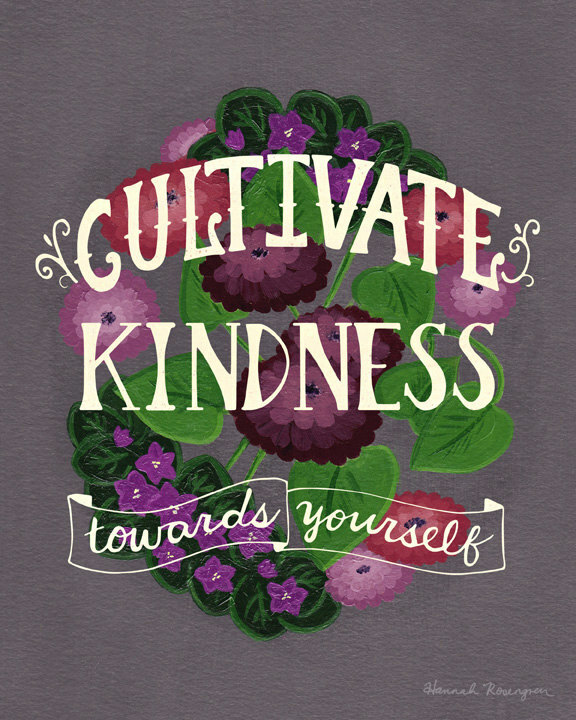 In addition to helping save the bees, you have designed another poster of things to “Help The Monarchs” and yet another to “Support Local Farmers”, and then perhaps the most important, “Cultivate Kindness Towards Yourself.” The world around us in part is a product of our thoughts and actions, the things we want, the things we need. It is true that those that care greatly for themselves, in an educated wholesome way, are more likely to take care of the world around them. How we exist in life together really has a lot to do with how we treat ourselves. Was this a positive affirmation stemming from your need to treat yourself kindly? Or more that you saw this need in others? I definitely agree that the tone of our thoughts heavily influences our actions and experiences, and I illustrated “cultivate kindness towards yourself” as a visual reminder for myself. Being self-employed in this age of technology and information – with emails and notifications constantly popping up and seeming urgent – I have to really remind myself to take a break once in a while. If I take care of myself I find that I can take care of other things (and address other issues through my artwork) in a much more efficient and helpful way. What is on the horizon for you that you feel you can talk about? Do you feel yourself being moved to work towards any other issues in society that need change? I have so many things I’d love to work on waiting in my sketchbook – but in the near future I’d like to work on a poster that could address the use of pesticides and their harmful impact on the environment and our health. I’d also like to create something more specific to Maine. My long-term goal would be to find a way to connect with kids about environmental issues – I would absolutely love to write and illustrate a children’s book someday! 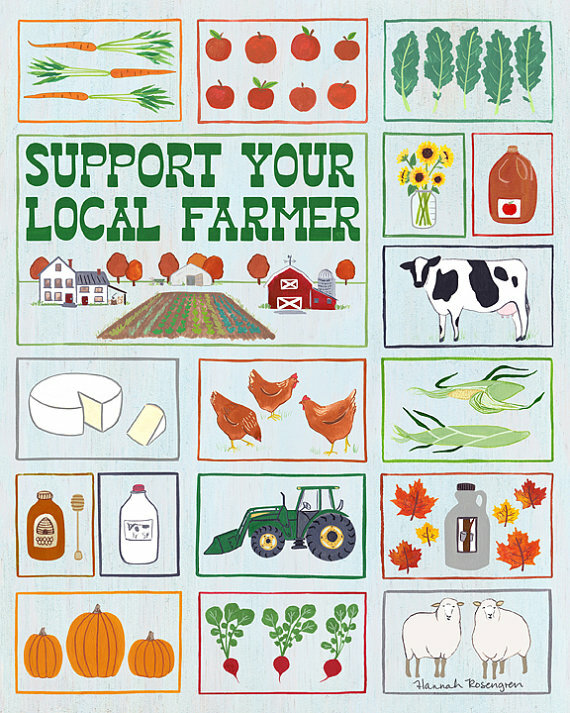 Hannah’s poster’s would make a great addition to homes, cafes and classrooms! This entry was posted in I N T E R V I E W and tagged bee, bees, environment, hannah rosengren. Thank you Danielle, Hannah is an inspiration!